As I surf teh Interwebs looking for holiday gifts, sifting through the vast amount of stuff out there makes everything blur. I keep looking and searching and then, finally, something stands out. Here's an idea whose time has come: the napkin notebook. My wordy family members and friends would get a kick out of this stocking stuffer. Bonus gift links for writers/creatives: The visual feast that is NOTCOT is featuring a daily gift guide. If you're looking for original gadgets, toys and accessories, start here. Gift categories include For Creatives, Techsessories, Naturally, Child's Play and Mimobots (an amazing assortment of designer USB flash drives). Review: "The Gift of Nothing"
1. What do you give the person who has everything? 2. In a completely empty space, what can people create? 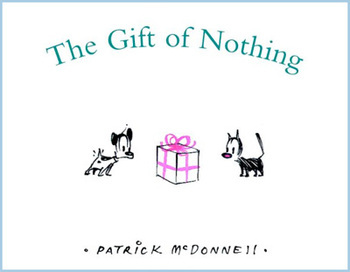 With its title being "The Gift of Nothing," the book's punchline is clear. What makes this story most satisfying is how it is told. Author/illustrator McDonnell uses a few well-chosen words and minimal, expressive drawings to show how one friend gives another a most appropriate present. Quality rules quantity in this world, in a clear and inspiring way. The book's age range is advertised as 3 to 6 years old. We know many in the 6-plus group, however, who love reading "The Gift of Nothing" over and over again. If you tend towards appreciating life's rich, simple pleasures, definitely consider knowing this tale. An occasional annual tradition of mine is to buy my brothers funky t-shirts. The stranger, the better. For a few years, it almost became a competition: could their sister outdo the weirdness of the previous year's t-shirt gifts? Invariably, I did, in part because I take challenges like this much too seriously. I loved scouring odd shops and new neighborhoods in search of the supremely bizarre T. My urban scavenger hunts took place before online shopping became so commonplace, yet the fun and thrill of finding Ts live on for me today. The WWW hosts a vast array of t-shirt stores, one more eclectic than the next. So which t-shirts did I buy for my brothers? Don't worry, bros — they are NOT grammar-based. (My brothers don't find grammar humor as funny as I do.) I'll post images of this year's winners after Christmas — my family reads my blog, and I'm not giving away the surprise. I want to see the looks on their faces when they first see these treasures. 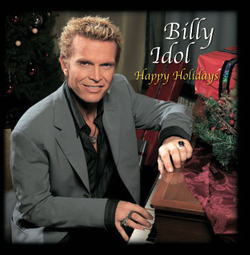 Billy Idol croons holiday tunes...really. Billy Idol has been on my favorite-music play-list for ages. I became a huge fan of his when I saw him perform live back in the day. While there, I experienced a life-changing epiphany about music's place in my life and my place in the universe (link to article I wrote in "annabellemag" where I describe this). I'm particularly interested in how artists evolve as they, well, get older. Dancers often retire while relatively young, and some turn to teaching. Painters and sculptors craft and create until either their hands or their eyes fail. Most actors never really quit their day jobs. Musicians make music for as long as they can, but many prefer to burn-out young rather than fade away, to paraphrase another perennial rocker. Then what do rock-n-rollers do when their life's work is to rock-n-roll and keep appealing to audiences? Over a lifetime, this presents all rock musicians with a challenge. A Billy Idol Christmas album is one of those ideas so profoundly wrong, it's right — so deeply uncool that, in the end, it's strangely cool. Indeed. Reverse-psychology marketing and MySpace social networking are promoting Billy's new musical leanings in an effectively viral way. Rock on, Billy. Happy holidays to you, too. UPDATE: In 2005, Billy Idol released an album called Devil's Playground. On it is a song titled "Yellin' at the Xmas Tree." Just found it on iTunes. 1. Was "Yellin' at the Xmas Tree" a test for his upcoming Christmas album, or the inspiration for it? 2. "Yellin' at the Xmas Tree"? What does one yell at one's Xmas tree?